May 3, second-year students of the USUE Department of Marketing and International Management majoring in Management (Advertising Management and International Management specialties) of RM-16, MM-16-1, and MM-16-2 groups became participants in the master class "Possibilities of Library Information Resources in Marketing Research of the Market" delivered by specialists of the Sverdlovsk Regional Universal Scientific Library named after V.G. Belinsky. The event was held within the framework of the Marketing course under the supervision of a senior lecturer Natalia Izakova. The students were introduced to resources of Belinky 's Electronic Library" (EBB), which total number of documents is 23 435 exemplars. Specialists of the library made a tour of the thematic reference rooms, Sverdlovsk Regional Center of the Presidential Library, presented the library funds of foreign literature, periodicals, humanities and social sciences, scientific information, books and even music funds. All the students have mastered the skills of finding marketing information using electronic resources in computer halls of the library. Elena Yakubovskaya, chief librarian of the Department of Cultural Events, fascinated everyone with an interesting and informative story about the world of the V.G. Belinsky library. The students and staff of the Department thank the library deputy director for socio-cultural activities Elena Garms for the opportunity to become acquainted with the library that traces back to 1899, successfully implementing state-of-the-art technologies and developing electronic resources. 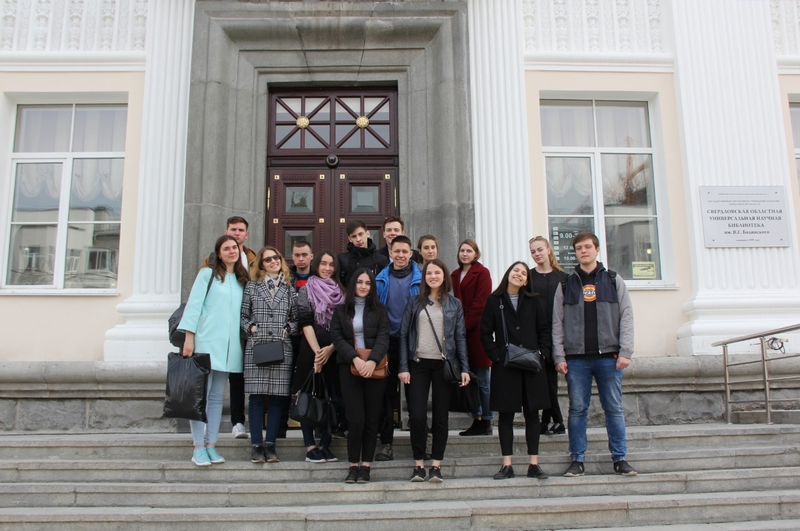 Anastasia Kalinina: "The tour to the Presidential Library allowed us to become acquainted with the additional educational opportunities and with the rich information resources of the library. I did not know anything about the library before, now it's interesting to drop in again and get acquainted with it in more detail. " Artem Irgibaev:"It was a surprise that even in the early morning there was a large number of people in the library halls who worked with literature. Thanks to our narrator for the ability to get involved in the process. " Alyona Brivkina: "For a long time I wished to see this amazing place, where everything is filled with meaning. I was struck by the room where the main part of the master class took place. I did not think that this library is equipped with the latest technologies. The specialist of the library, who conducted the excursion, told the most interesting facts very briefly and fascinatingly. I really liked her wide reading and the manner of speech. I could not imagine that in our city there is such a huge fund of the most diverse literature. We have spent 100% quality time! Many thanks for this opportunity! " Ekaterina Polnyakova: "The excursion to the library left entirely pleasant impressions. The specialists told in detail about the capabilities of the information complex of the library, taught us how to work with information retrieval. Interesting was the walk-acquaintance over the library center. We were surprised to learn that the library is much more than a traditional place of reading literature and online services. The music room, regular exhibitions and performances, numerous courses and clubs make it a comprehensive social and scientific complex, a place both for study and for recreation and communication." May 3, second-year students of the USUE Department of Marketing and International Management majoring in Management (Advertising Management and International Management specialties) of RM-16, MM-16-1, and MM-16-2 groups became participants in the master class "Possibilities of Library Information Resources in Marketing Research of the Market" delivered by specialists of the Sverdlovsk Regional Universal Scientific Library named after V.G. Belinsky.